Your bedroom, it’s a place that’s suppose to be your sanctuary — a peaceful space, seemingly dedicated to you. And yet there’s times when we can find our bedrooms looking anything but tranquil. In the recent Houzz.com article titled, “Designer Tips for Creating a Better Bedroom,” Houzz contributor, Christine Tusher takes readers through an exciting list of items that can help you build a better bedroom. First on this list is the rug. Tusher explains that there is nothing more jarring then jumping out of bed in the morning and having your feet hit the cold floor. Rugs placed strategically can add elegance to a bedroom, not to mention comfort to your feet. For the full article click: Houzz.com article. Next to real estate, home decor is a big passion of ours and we are consistently looking for new decor ideas that bring life and elegance to homes. 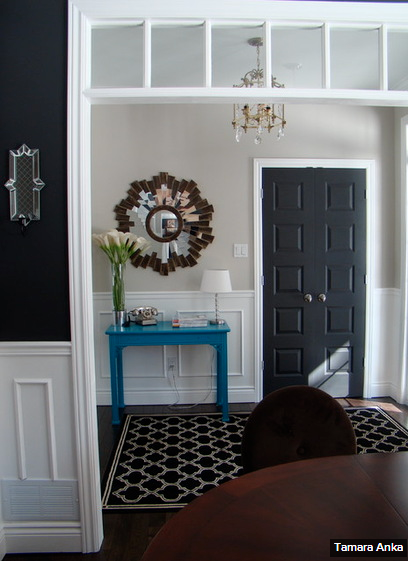 Over the weekend between family events and client appointments, we came across an interesting Houzz.com article titled, “11 Reasons to Paint Your Interior Door Black.” This intrigued us, as it’s something that is rarely seen in homes. It seems like a radical idea but Houzz.com (alongside some photos for proof! ), outlined the benefits of black doors. Noted first was that black doors are classy. They are elegant. A black door instantly adds sophistication to just about any room. For the full article click: Houzz.com article.